198 pages | 115 B/W Illus. 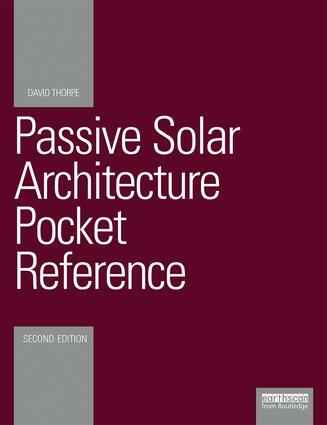 This handy pocket reference contains a wealth of information on a range of topics including the principles of passive solar building and passive house, a ten-step design and build strategy, calculating solar irradiance, factors affecting the choice of building materials, passive heating and cooling principles and techniques in different climates, the Passivhaus Standard and natural and augmented lighting and notes on technology and building occupation. The book also includes conversion factors, standards, resources and is peppered throughout with helpful illustrations, equations, explanations, and links to further online resources. Ideal for practitioners, architects, designers, consultants, planners, home builders, students and academics, and those working in development contexts, the book is intended to act as an aide memoir, a reference supplement, a resource and an overview of the field. Rich in background detail, the book also includes at-a-glance tables and diagrams, equations and key definitions. David Thorpe is a lecturer on one planet living at the University of Wales Trinity Saint David, a consultant on renewable energy and sustainable building, and author of several academic books and numerous articles. He is also Founder/Patron of One Planet Council.